Laser Engraved personalized Suede Leather Collar. Soft suede collars lined in comfortable nubuck leather with bright nickel hardware. Laser engraved stainless steel plate with a state-of-the-art fiber laser. Personalized aluminium buckle dog collars can be laser etched with up to 4 lines of information. Each is individually made in the US using premium jacquard woven ribbon securely stitched to industrial strength, color-matched nylon webbing. The Luumi LED Safety Lights provides safety for you and your dog. With the flexible silicone bands, the LED lights can be easily attached to any harness, collar and/or lead. 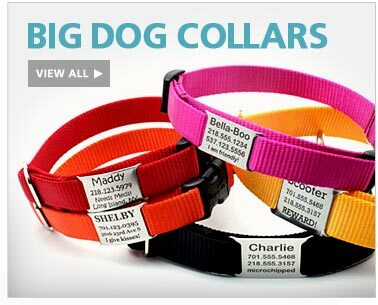 Heavy duty webbing dog collars that can be personalized up to 3 lines of information. Made with Superior quality chevron grosgrain ribbon is securely stitched and fused to premium industrial strength nylon webbing. Our Rolled Leather Dog Collars are made of strong, supple Latigo leather. Durable rounded collars have a fashionably classic look Brown Collars feature brass-plated buckles Black Collars have nickel-plated buckles. Polka Dot Dog Collars in three eye-catching colors have a plastic, quick-release clasp buckle. Matching dog leashes ensure a fashionably coordinated look.